Cradle cap is a term used to refer to any red scaly rash on the scalp of babies. Cradle cap is not a medical diagnosis, but simply a descriptive term, like the term diaper dermatitis. There are a few causes of Cradle cap, including Seborrheic dermatitis, Atopic Dermatitis and Plaque Psoriasis. 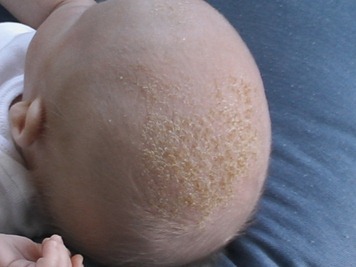 Seborrheic dermatitis is the most common cause of cradle cap. Before Cradle Cap can be treated, the specific cause of the Cradle cap must first be diagnosed. To diagnose the cause of the Cradle cap your doctor will have to examine the baby from head to toe. A concomitant rash in the skin-folds and the nappy area might indicate Seborrheic dermatitis, whereas a generally dry skin might indicate Atopic Dermatitis as the cause of the Cradle cap. Nobody knows exactly why babies develop Seborrheic dermatitis or Atopic Dermatitis. The theory is that Seborrheic dermatitis is related to the overgrowth of the yeast Pityrosporum ovale which was recently renamed Malassezia furfur. The yeast overgrows because of overactive oil glands on the scalp. The oil glands become overactive because of genetic influences or perhaps because of hormones passed to the baby from the mother. Seborrheic dermatitis is not due to bad hygiene or a bad diet! Perhaps as many as 50% of babies born in the developed world have some degree of cradle cap. Once the diagnosis is made, treatment can be started. The following treatment options will apply especially to Cradle cap caused by Seborrheic dermatitis. The are really 2 aspects of Cradle cap to treat; scaling and redness. The scaling develops from the areas of redness. Once the redness is resolved the scaling will cease. Initially however, treatment is targeted at both scaling and redness. Redness can be treated with mild topical corticosteroids. Corticosteroids is not dangerous if used correctly and sparingly. Do not let anybody tell you different, because mild topical corticosteroids can rapidly improve the condition and make your baby feel better. Mild topical corticosteroids should be applied once of twice per day while there is redness. If there is no redness do not apply any corticosteroids. Ketoconazole containing shampoos can also help. Ketoconazole is an anti-fungal that will help to eradicate yeasts. It is a good idea to dilute the Ketoconazole shampoo perhaps 50:50 or greater initially, to make sure the shampoo does not irritate the babies skin. Use the shampoo every second day initially. Ketoconazole creams can also be applied once or twice per day to the red areas. Scaling is treated by moisturising the skin. Many different oil and creams can be used for this. Examples include Vaseline, over-the-counter moisturizers, olive oil, borage oil, tea-tree oil, aloe gel etc. Cradle cap due to Seborrheic dermatitis will resolve spontaneously within a few months in the vast majority of babies. Seborrheic dermatitis/eczema is a form of eczema that can appear only on certain parts of the body. 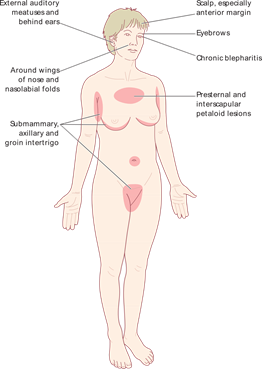 The appearance of the rash varies depending on the area of the body that is involved. On the scalp the rash typically appears red and scaly, whereas in the skin folds the rash is typically devoid of scale and therefore appears red and moist. Not all of these areas have to be involved and most often it is just the scalp areas. The rash is generally not very itchy, but some people describe a burning sensation on the involved areas, especially the scalp. People that suffer from so-called “Dandruff” is frequently in fact suffering from Seborrheic dermatitis. Dandruff is not a medical diagnosis and refers to the small white skin flakes occurring on the scalp. There can be many reason for excessive flaking of the scalp, of which Seborrheic dermatitis is one. Seborrheic dermatitis occurs in two separate age groups, before 1 year of age and after puberty. After puberty men tends to be affected more often than women. Nobody really knows the cause of Seborrheic dermatitis, but the overgrowth of a certain organism called Pityrosporum ovale has been implicated. However, not all people with Seborrheic dermatitis have Pityrosporum ovale overgrowth. The finding of huge numbers of Pityrosporum ovale in areas of Seborrheic dermatitis might therefore be just the result of the Seborrheic dermatitis and not the cause of the Seborrheic dermatitis. Another theory about the cause of Seborrheic dermatitis is that Seborrheic dermatitis is a disease of skin overgrowth just like Psoriasis. Another important association with Seborrheic dermatitis is infection with HIV. People with HIV tend to develop Seborrheic dermatitis when the suppression of their immune systems reaches a certain level. The treatment of Seborrheic dermatitis involves the use of various shampoos containing one or more of the following ingredients: Zinc, Selenium, tar and anti-fungals. A corticosteroid containing lotion, cream or mouse can be used during a flare up. Recently Tacrolimus and Pimecrolimus has also been used successfully for the treatment of Seborrheic dermatitis.